I was having a hard time putting away the Holiday Baskets table topper after the holidays, so I decided the answer was to make something new. When we made the Silly Strings blocks back in July 2012, I was living in the tiny adobe oven casita, suffering from all kinds of allergies (the allergist literally told me I was allergic to EVERYTHING … though since moving out of that place, most of my symptoms have disappeared) and had no time/space/energy to play. I always wanted to revisit that technique and now I had an excuse to play with those Silly Strings. Once you get past the fear of curves, these blocks really are dead easy to make. If you weren’t around then, you can find the directions here. I also have been wanting to try quilting a giant spiral and I thought something this size (30 inches square) would be do-able. I drew a series of concentric circles 1/2 inch apart for the center, to use as guides for free motion quilting, starting from the center and working my way out. When I got out to the largest circle drawn (7 inches in diameter), I switched to the walking foot on my machine and used the foot as a guide to continue the spiral–the distance from the needle to the side of the foot is also 1/2 inch. Here’s the top down look … be kind and don’t scrutinize the center of that spiral too closely–I was in a hurry to finish and out of practice. 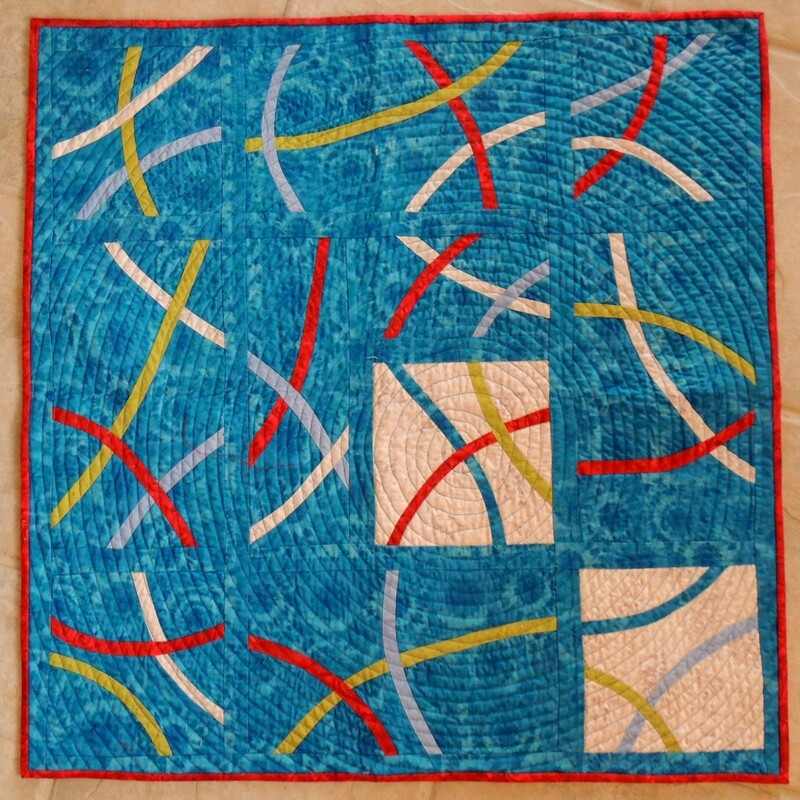 I learned (the hard way, by doing it wrong on this one) that with this style quilting, you want to spiral out of the center of the quilt in the clockwise direction or you’ll end up with most of the quilt on the right side of your needle. 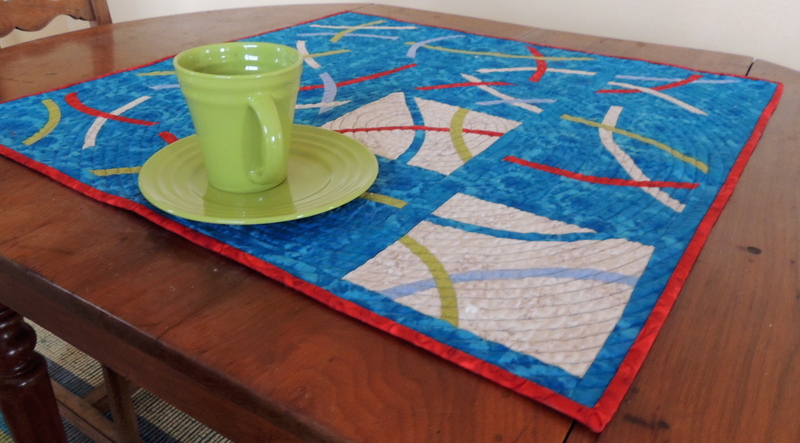 Machine quilting looks just fine. My practice pieces are not blog worthy. This one is most definitely worthy to share. Isn’t it great to finish a previously started project. A smaller piece is better than an unfinished one. I took a bunch of my quilts to share with a small nearby guild today. There was a time when I wouldn’t haven shared because they weren’t worthy, but sometimes I think it’s OK to share our less-than-perfect work. Among the quilts I took was my very first ever quilt–a small 12 wall hanging made from two cotton shirts I cut up in a workshop.